Phase 3 are proud providers of cable connectors to leading cable suppliers worldwide. Phase 3’s connectors are perfect for power cable that is utilised for mains supply, stage use, utilities, power generators, switchgear and electrical control systems. 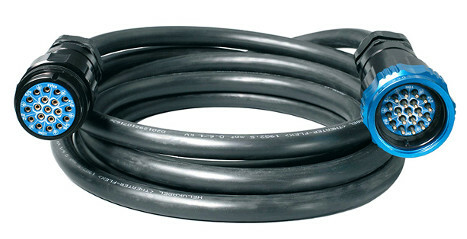 Temporary power generator companies often purchase rubber cables with pre-assembled connectors and Powersafe Power Cable Connectors are the most reliable pre-assembled option to offer your customers. Phase 3’s single pole connectors are considered the industry leader in quality and safety for industrial power plugs. Our Showsafe Multi-Core Cable Connectors are perfect for touring application and are fully socapex compatible with UL approval. Powersafe power cable connectors are 100% manufactured and assembled in the UK by Phase 3. The electrical plug’s mating system is mechanically keyed and locked, meaning they cannot be disconnected accidentally under load. 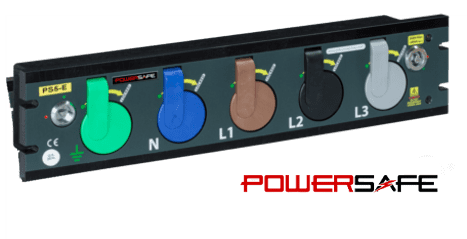 Powersafe are the industry’s safest high current powerlock type connectors. The cable connectors are utilised globally by the cable industry for supply to their temporary power generation customers, with a high current carrying capacity of up to 800 amps. The connectors are standardised for H07RN-F industrial flexible cable that is designed for building sites and is ideal for festivals, concerts, sporting events and severe industrial environments. If you’re looking for a suitable cable to supply temporary power to audio-visual and lighting systems together with on site electrical distribution equipment, we suggest H07RN-F. The powerlock type plug is an industry leader in quality, with full UL approval. Powersafe are fully compatible with other brands such as Litton Veam and safer than US industry’s Cam-Lock connectors. The electrical power cable connectors can be delivered worldwide with the quickest lead times guaranteed through our network of distributors. Phase 3’s Powersafe connectors are one of the worlds premier choices for industrial plug for flexible rubber cable assembly solutions. Our product configurator allows you to input your specifications and receive a bespoke online quote. The Powersafe Sequential Mating box is a three phase power distribution board designed for use with temporary electrical installations with a current rating of up to 800 amps. On the mating box there are Panel Mounts for three phases plus Neutral and Earth secured onto a panelboard. The generator connection point is compatible with other manufacturer’s connectors. Phase 3’s Sequential Mating Box comes in a compact design which allows mounting. The socket unit is available in Source or Drain versions rated at 800A to be compatible with all Phase 3 500A & 800A connectors as well as Litton Veam 400A and 660A cable connectors. There is an optional lid available which ensures water and dust protection to IP67 rating. Phase 3’s Showsafe 19-Pin Connectors are perfect for touring application; they’re manufactured in the UK to the highest industry quality. [wiki]. The 19-pin connectors are UL approved and are quickly becoming the industry standard for events. The electrical connectors are perfect for highly flexible multicore Socapex cable that is widely used in the connection of lighting technology and dimmer racks in events of all types around the world. 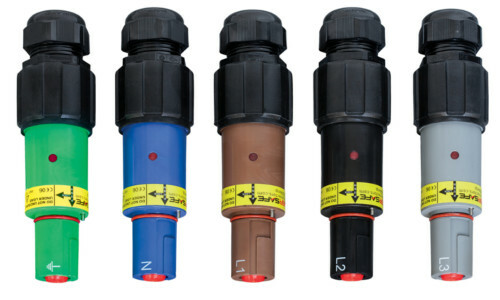 The connectors are suitable for use in dry and damp environments. Available in 3 pin, 5 pin, 7 pin and 19 pins, the socapex cable compatible connectors are the choice of cable assembly companies who supply events professionals across the globe. They have been chosen to connect lighting at spectacles such as Glastonbury and even for major artists like Sir Paul McCartney!